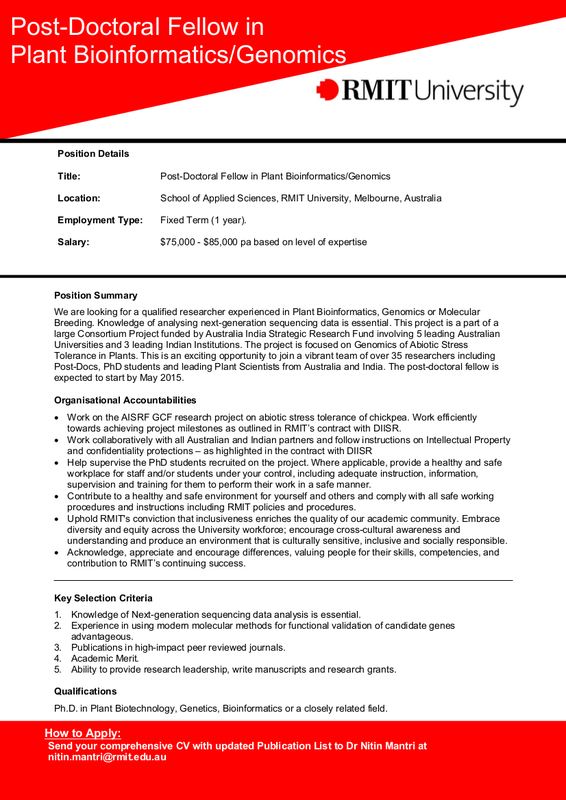 We are looking for a qualified researcher experienced in Plant Bioinformatics, Genomics or Molecular Breeding. Knowledge of analysing next generation sequencing data is essential. This project is a part of a Large Consortium Project funded by Australia India Strategic Research Fund involving 5 leading Australian Universities and 3 leading Indian Institutions. The project is focused on Genomics of Abiotic Stress Tolerance in Plants. This is an exciting opportunity to join a vibrant team of over 35 researchers including Post­Docs, PhD students and leading Plant Scientists from Australia and India. The post-doctoral fellow is expected to start by May 2015. Employment Type: Fixed Term (1 year).